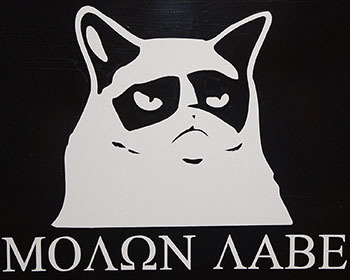 “Grumpy Cat hates GUN control,” says the description of this truck-sticker combining Grumpy Cat with “molon labe,” the Greek phrase roughly meaning “come and take them.” Originally referring to the melee weapons of the Greeks in the 5th century BC, it’s been used as an anti-gun-control slogan in recent years. It’s often comorbid with “cold, dead hands,” an NRA slogan dating from the 1970s. The latter is seen more frequently, as on this Black Rifles Matter shirt.